Find My Workspace lists over 95% of the serviced offices market in Shanghai CBD. Simply click Request Quote to check pricing for one office, or Add to Basket for multiple offices. Shanghai CBD, Shanghai - . This centre is located on the 29th floor of this magnificent skyscraper. It is the tallest building in Asia, and the 2nd tallest in the world among all skyscrapers ever built. Shanghai Tower is located in the heart of the bustling Lujiazui Financial and Trade Zone. Lujiazui is a well-developed world class financial and commercial hub, representing Shanghai and China’s amazing growth in economy and city development, it also features one of the most stunning skylines in the world, with numerous prime office towers, high-end river side residential buildings, upmarket malls, headquarters of China Central banks, and the Shanghai Stock Exchange. 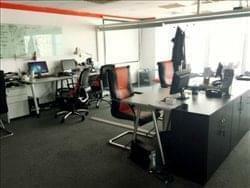 This office space is conveniently located in central ​​Shanghai, near People’s Square and The Bund. The office space has beautiful views of the city centre. It is cozy and dynamic with a pantry at the entrance, a meeting space (business or seminar), hot desks, and private desks, allowing you to work seamlessly while connecting with like-minded people. The large glass enclosed conference/meeting room can accommodate 15 people. Individual seats with a reclining table, and breathtaking views of People’s Square from the 17th floor! The room is also equipped with white board and projector. This center is located on the 7th floor of an international Grade A office tower in the heart of the bustling Lujiazui Financial and Trade Zone. Lujiazui is a national-level development zone designated by the Central Government, featuring one of the most stunning skylines in the world, prime office buildings, upmarket malls, and the Shanghai Stock Exchange. Close to the Huangpu River, OFC is an environment-friendly modern building neighboring the highest buildings such as Jinmao Tower, IFC, and Shanghai Center. Located on Level 20 of this centre, the building offers superb state-of-the-art serviced office facilities with high-quality furnishings, generous filing space, multiple meeting rooms, and breakout areas in a distinguished business environment. It is truly your ultimate choice for your business. The building features a lifestyle shopping mall with around 250 shops, of which more than 40 restaurants provide a wide choice of international cuisines, two premium Grade-A office towers, three luxury hotels /serviced apartments and more than 1200 parking spaces. This centre is undoubtedly the office destination for prestigious MNCs. To obtain information for your selected Shanghai CBD Serviced Offices, please tick the "Add to basket" box for each office you prefer and complete the form below. We will then send a detailed report via email.